BICC brief 39 is a documentation of the results of the international conference "Migration and Displacement in Sub-Saharan Africa. The Security – Migration Nexus II" (13-14 February 2009, Bonn). The event was supported by the Federal Ministry for Economic Cooperation and Development (BMZ) and was devoted to south-south migration with a focus on displacement. 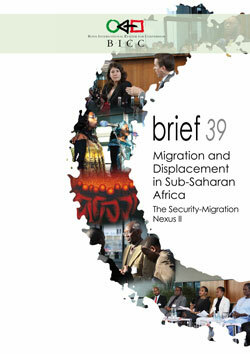 In BICC brief 39 “Migration and Displacement in Sub-Saharan Africa. The Security-Migration Nexus II”, experts present the current state of research, consider aspects for future study and discuss concrete political approaches. Speakers included prominent representatives from the field of research, the relevant ministries and African regional organizations, as well as local and international humanitarian organizations. BICC brief 39 documents points of view e.g. of the African Union (AU) and the Economic Community of West African States (ECOWAS), the UN High Commissioner for Refugees (UNHCR) and the International Committee of the Red Cross (ICRC), the Internal Displacement Monitoring Centre (IDMC) in Geneva as well as the Federal Ministry for Economic Cooperation and Development and the German KfW Entwicklungsbank.